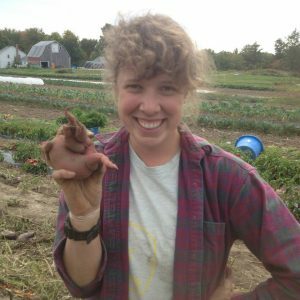 As an aspiring farmer and a student of the social sciences, attending the Tilth conference provided a unique opportunity to engage with topics ranging from applications of sustainable agriculture to issues of gender and race in the organic farming world. Before coming to Washington State University for graduate school to study the sociology of food and agriculture, I was living and farming in Maine, attending the annual Maine Organic Farmers and Gardeners Association’s Farmer to Farmer Conference on several occasions. I was curious to see how the two organic farming conferences compared, in two states with strong organic and sustainable farming traditions. I expected similar, high quality and intriguing talks on organic farming applications and techniques. At the Tilth Conference, I attended a talk on integrating pigs into a crop rotation system to improve soil quality, organic matter content, and nutrient composition. The presenter was highly engaging, innovate, and passionate, integrating clinical research and practical day to day operations on her farm in the same way I have seen the organic farmers in New England do. However, I was pleasantly surprised and excited by the inclusion of talks under the track of Agriculture and Society at the Tilth Conference, a track I have not seen on programs at similar farming conferences. I attended two very meaningful sessions in this track, one on Women in Agriculture and another entitled The Unbearable Whiteness of Farming. Moderated by Audra Mulkern of the Female Farmer Project, the first panel of women farmers created a safe and inspiring space to talk about gender and farming; the labor, both physical and emotional, expected of women; and the importance of representation and mentorship for future female farmers. It was the second session though, The Unbearable Whiteness of Farming, that was the most impactful. I could tell it was going to be a different kind of session from the moment I walked into the room. The lights were off, there was paper and pens on each table, and before any of the panel spoke, one of the women had us all stand in a circle to stretch and to make a land acknowledgement recognizing the Spokane tribal land upon which we stood. The four women of color on the panel did not have technical research to present, but rather spoke their truths about what it was like to farm as a person of color. And that is what made the session so powerful. I do not feel it is my place to write those truths here, for they are not my stories to tell; however, I will say that I walked away from that session wishing it were a conference in and of itself. The thorny issues of white supremacy, colonialism, slavery, and reclaiming farming from all of it could not be adequately dealt with in the hour we had together. We need more time too examine that unbearable whiteness of farming to meaningfully address systems of power that maintain inequality and injustice. For example, there is a growing movement to address black land loss due to discriminatory government policy as well as a lack of access to capital and overall poverty (Center for Social Inclusion 2011). Though farmland has been decreasing across the board, black farmers are being disproportionately forced from their land with one out of seven farms being black-owned in 1920 down to just one out of 100 by 1992 (Kromm 2010). Thus, I encourage all those involved in sustainable farming, in Tilth and beyond, to reflect on any privilege they may have, to think about connection to land and what that means when we think about race, power, and justice. We need all the farmers and farmland we can get, but we need to think about how to heal from past violence and move forward with honor, humility, and courage to do better. Center for Social Inclusion. 2011. Regaining Ground: Cultivating Community Assets and Preserving Black Land. Kromm, Chris. 2010. “The Real Story of Racism at the USDA.” The Nation.